Suppose you want to reverse engineer an old Watkins Johnson double balanced mixer, perhaps a WJM4A. You might want to know the forward voltage of the diodes that are inside. You can almost always access the diode characteristics through the IF port of a double-balanced mixer, without cutting off the lid. The forward voltage for a Schottky diode is defined as the voltage at which the device draws 1 ma Low forward voltage diodes (less than 0.3 volts) are referred to as low barrier diodes, diodes with VF between 300 mV and 450 mV are medium barrier, and diodes with VF greater than 450 mV are called high barrier diodes. 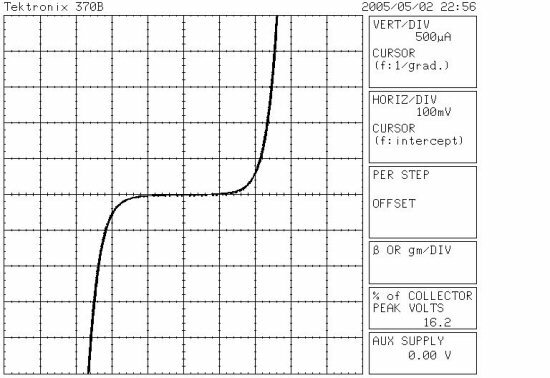 There is no better way to measure the forward voltage of a Schottky diode than using a curve tracer. By the way, a great source for Schottky ring diodes is... (insert your company's name here for $50/month!). In this example we will assume you own a Tektronix 370B curve tracer, the best there is. However, the procedure can be adapted to any model curve tracer if you will put on your thinking cap for a few minutes. Always start by disabling the output of the curve tracer to your DUT, and setting the collector voltage to zero (it's a big knob, you can't miss it). Turn the collector supply knob all the way counterclockwise to set it to zero. Cycle the 370B on/off to clear out whatever settings that last person used. Although the 370B defaults to very benign conditions, you should make a habit out of checking a few things we will describe here; if you have an older CT, you will need to manually set more of the control knobs. You should check to see that the polarity of the collector supply is positive (set to NPN on old curve tracers) and it is in swept mode as opposed to DC or AC modes. You won't be using the step generator, so you don't have to even look at any of its controls. 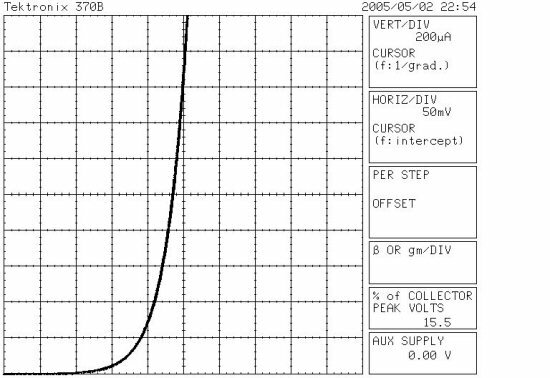 The polarity of the collector supply doesn't matter for this measurement, you will be looking a diode IV curve in either polarity. Set vertical/division to 200 uA. Set horizontal/division to 50 mV (the lowest setting). Set collector supply to "emitter open". Set peak power to to the lowest setting, .08 W (should be there already). Set maximum collector voltage to 16 volts (the lowest setting, it should be there already). Now you are ready to begin the measurement. Enable the outputs that are connected to your DUT (you could be plugged in to either the left side or the right side of the CT). The forward voltage is 260 mV in the above curve (voltage at 2 ma, at the top of the graph). You can reverse the leads and measure the other two diodes in the quad to compare how balanced they are to the first pair. We measured almost exactly 260 mV also, they are nicely matched. An optional way to look at them together is to set the polarity to "AC" which sets the origin to the middle of the display. Now when you crank up the voltage you can see both diodes. 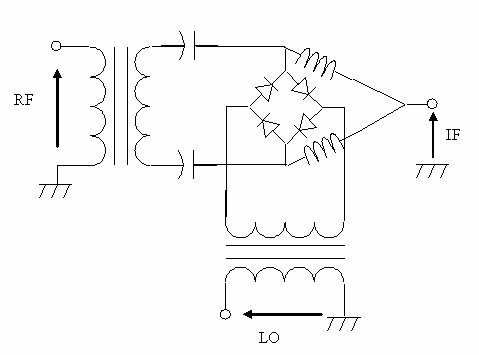 Here we change the current per division to 500 uA so we could measure both VFs at 2 ma Again, we read 260 mV for both diodes (here you need to look four divisions from the center line to read 2 ma). If this still isn't clear, please send us your questions!